During Laughter Parties on the Phone, we laugh for no reason. There aren't exercises like we do in live laughter sessions. It is exercise, but we're on the phone. You can laugh as much or as little as you want. You can call in or hang up. Even though it we like hearing each other's laughs rise and fall, you can mute yourself and just listen in. 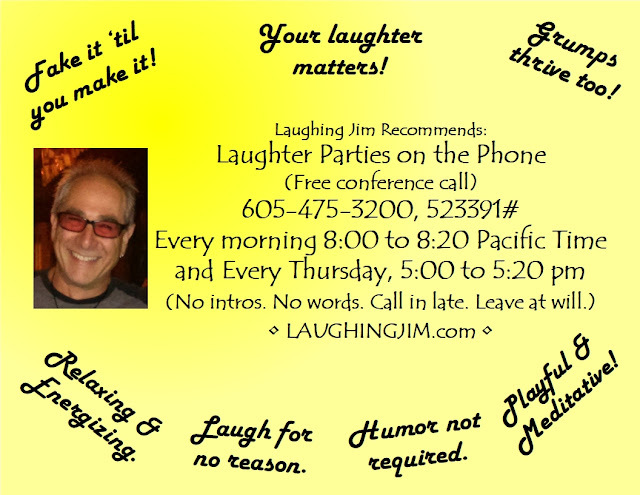 Here is info about the laughter parties on the phone that I join on most days at least once. Note that I host the Thursday one at 5:00 pm Pacific time. We don't do introductions, but at the end of the call, after the host brings us back from the laugh with some deep breaths there is a chance to say hello if you want to stay on and share. Official FREE Laughter Party on the Phone Times and Digits! We don't use words or introduce ourselves until the share time at the end. Thx! 8:00 am to 8:20 am Pacific. I host the Thursday eveniing call. The host also gives a couple of time updates and moves us into breath after 20 minutes with a "Very good. Very good. Yeah!" Then we have a round of gratitudes. People are free to come late and leave without a word or even a chuckle. There are also international laughter parties on Skype, and they are a real hoot. Some of them last only ten minutes, like on World Laughter Day, the first Sunday of the month. On World Laughter Day, people call in and laugh together for ten minutes every hour on the hour. If you search Skype for "laughter party" or "laughter club" you will be pleasantly amazed! Ha!